At the beginning of the week I was becoming increasingly concerned about this match, as England were in the semi-finals of the World Cup the first time in 28 years. There was speculation about what would happen if England were in the final. Which was going to clash with our match. However, England were unsuccessful and the Leicestershire & Rutland v Nottinghamshire match at Rothley Park Golf Club could continue as planned. 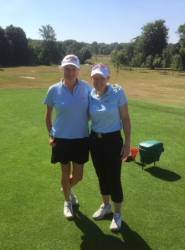 The weather was once again very hot and humid; the course was in fantastic condition considering how dry it had been. We got off to a great start in the morning foursomes, all three matches were incredibly tight and all were decided on the 18th green but they all went in Leicestershire’s favour. The pairs were very strong and fought hard to secure 2.5 points. 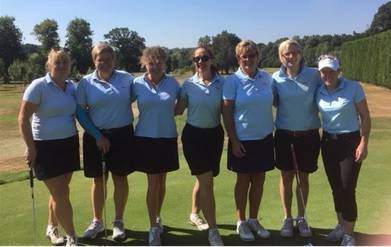 Sue Holwell & Barbara Suffolk (Lingdale) won 1up, Cath Arter & Alison Smith (Rothley) halved and Clare Bailey & Katie Underwood (Birstall) won 1up. We all went into the afternoon singles feeling very positive, again the matches were very close with the possibility of every match going either way. Half of the matches went to the 18th hole. Leicestershire & Rutland played excellent golf and secured 4.5 points out of 6 in the singles to achieve an overall result Leicestershire & Rutland 7 - Nottinghamshire 2. 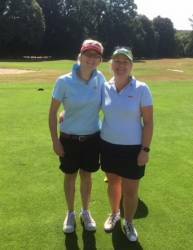 I am very proud to report that Cath Arter (Rothley & L&RLCGA Captain) halved her foursomes match in the morning with Alison Smith and won her singles in the afternoon to secure 6 points, successfully achieving her 2nd team County colours. A great day for sport, Djokovic won the men’s Wimbledon final, France won the football World Cup, Brandon Stone won the Scottish open and Leicestershire & Rutland’s Ladies 2nd team had a fantastic win over Nottinghamshire. Well done to all who played.